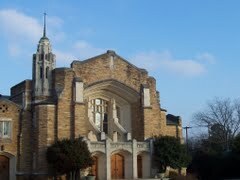 I am fortunate enough to live a block behind the Robert Carr Chapel which is on the TCU campus. TCU at one time was a Disciples of Christ owned university---I have heard--but must admit that I am not sure--that they are no longer connected---it is just a private university now---the chapel is directly west of me. Directly east of me - 2 or 3 blocks is Saint Stephen Presbyterian church which is a huge complex on the side of the hill that I live on over looking the Forest Park area of Fort Worth. The beauty of where I am is that they BOTH have bells and hymns that they play. The tower at TCU also chimes the hour. I have loved hearing these bells. While a student at LTU and living in the dorm---Keeny Hall also had bells that chimed---I don't remember it playing hymns though--just chimed the time. I loved those chimes a LONG time ago! 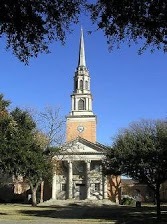 It is a sweet sound and often a reminder to pray----such a great place to live--chimes and bells in stereo! Since LTU is a secular university it was highly unlikely that they would have played hymns. I too remember the chimes while a student at Tech in the early 60s. Later when working for Panola College in Carthage, Texas, they had been gifted a set of chimes that did play hymns and holiday music. They would play at noon and five p.m. Controlled by an electronic scheduler located in their library. You might recall that in Farmerville, the fire department would sound the fire whistle at noon to mark the time of day. I doubt that happens anymore.